Think you know airports? Musment takes a look at ten curiosities about these prevalent transportation hubs. Farewells, welcomes, nerves, delays, excitement, queues…airports can take on quite an emotional burden! As the setting for moving personal stories, whether accompanied by an, “I’m going to miss you” or an, “I’ve been waiting for this vacation all year and it’s finally here”, dare we say that airports have quite a high concentration of tears per square foot? Did you know, though, that airports have a number of secrets to which few are made privy? Due to the typical hustle and bustle, the details of an airport’s surroundings can often escape us, so we usually don’t notice the rhyme or reason behind them. Here are ten things about airports that you probably didn’t know. 1. You won’t be offered an upgrade so easily. We all dream that someday we will arrive at the check-in desk with our economy class ticket and being told, “We are offering you an upgrade to business class.” Not to rain on your parade or anything, but keep dreaming because the probability of this happening is scarce. Dressing in your best ball gown, smiling from ear to ear, complimenting the employee in question, and even knowing a crewmember won’t help. Today, it is only the airline’s frequent fliers who can opt for this luxury, and even for them, it is difficult. Sure, you never know, but just don’t hold your breath. 2. You can find out how long the line at security is before arriving. There is a free mobile app called My TSA that allows you to check the security wait in real time which lets you efficiently calculate your timing. In addition, among other things, you can find flight information and the meteorological conditions at your destination on the My TSA app. 3. Only 3% of lost luggage is never found. In other words, 97% of lost luggage finds its way back into the hands of its owner sooner or later according to a study by the air transportation company, SITA. So, if you lose a suitcase, take a deep breath and wait a couple of days as the odds are in your favor. In addition to compensation, some airlines will give you a survival kit to make up for the inconvenience. 4. The sum of money in coins that passengers leave behind is surprising. Passengers often do not collect the small change that they take out of their pockets before going through security. Thus, these coins accumulate into truly incredible amounts. Last year, JFK in New York collected the most money in a year—a whopping $42,550! And what do they do with it? No, the employees don’t get to keep it. Instead, they invest the money in airport maintenance. 5. As you walk through the airport, you are receiving subliminal messages. Airports are designed to facilitate passengers transiting through an unknown environment. This is called wayfinding, and it is a collection of signs, shapes, colors, and lights that send subliminal messages to the brains of those making their way through the airport. An example? Having letters with round edges for Terminal 1 and sharper edges for Terminal 2. If you head in the wrong direction, you will unconsciously detect this when you try to find your gate. 6. Currency exchange in the airport is among the worst. Airport money exchanges are a convenient way to bail yourself out if you did not think about the currency ahead of time. However, the type of exchange that you will be offered at the airport is pretty bad; you will have to be willing to lose a significant amount of money with the transaction. It is much better to take money out directly from an ATM at your destination. 7. Being one of the last to get to baggage drop-off has its advantages. The one who laughs last laughs the longest—airports work in the same way. It is likely that if you are one of the last passengers to drop off your bags before the flight, it will be one of the first on the belt at baggage claim once you’re at your destination. This is a little trick for when you are in a rush or if you are impatient! Remember that to go directly to a baggage drop-off, you need to have checked in for your flight ahead of time. 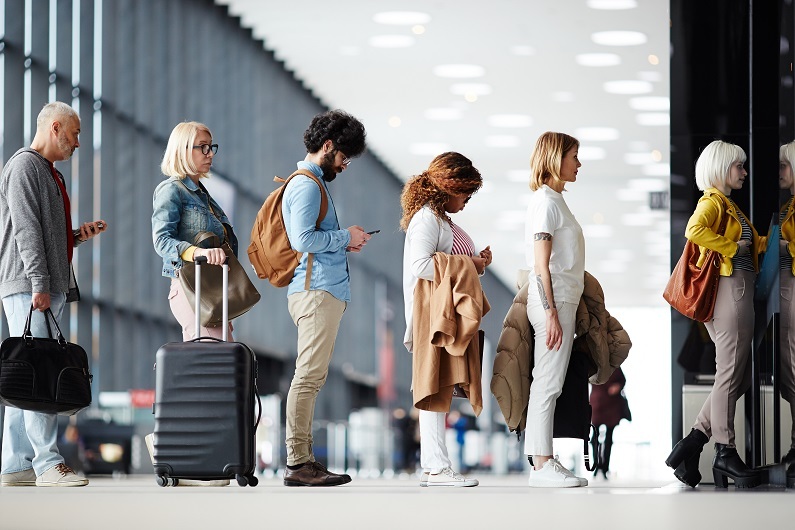 This is a great option because if you are one of the last to check in once you are at the airport, you risk finding yourself with a ticket on an overbooked flight or not being able to choose your seat. 8. The letter X in airport codes does not mean anything. Are you one of those who has memorized all the airport codes? If this is the case, you are sure to recognize LAX and PHX, for example. And you might ask yourself, what is the X doing at the end of the airport code for Los Angeles and Phoenix? Nothing. It was simply tacked on in the 1940s when airport codes went from having two letters to three. 9. The most-sold product in airports is water. It is a known fact that flying can dehydrate you, so it is not surprising that water is the most-sold product in airports all over the world. You will, however, pay the price of gold for it! Luckily, many airports now have water fountains making it more sustainable and economic to bring a water bottle from home and fill it up as needed. 10. The entertainment offered at some airports is extraordinary. Did you know that there is a golf course at Hong Kong’s international airport? And San Francisco’s has a yoga studio? And that Schiphol in Amsterdam features an annex of the Rijksmuseum displaying works created by Dutch artists? As you can see, airports are no longer the setting of boring waits. In addition to their commercial aspect, you can find a wider and wider scope of entertainment offers that help layovers “fly” by.